The first story of the new book series featuring the Guardian Princesses. These superheroines work together to protect people and the planet for future generations. Princess Terra is the Guardian of the Land. Her role is to care for and protect the land that allows her fellow people to lead healthy and balanced lives. All is well until the greedy King Abaddon comes and tries to take it away and make it his own. 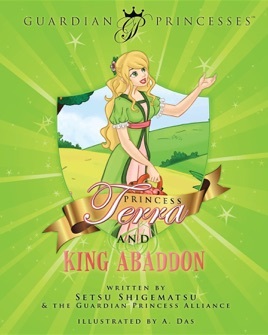 How will Princess Terra stop King Abaddon from forcing them off their land?